Here we go again. It's the PyroOlympic again. And my kids are excited to watch the little star zooming into the sky like rockets. They are pleasing to the eyes, but not easy on the ears. Nonetheless, its really a family affair after all. It's time to pack some dinner and head out again at the SM Mall of Asia. I remember the first time we went there, the parking is full and going home was a mess. Good to know the management is ready and last year it was a nice experience. And I believe we should do it over and over again. 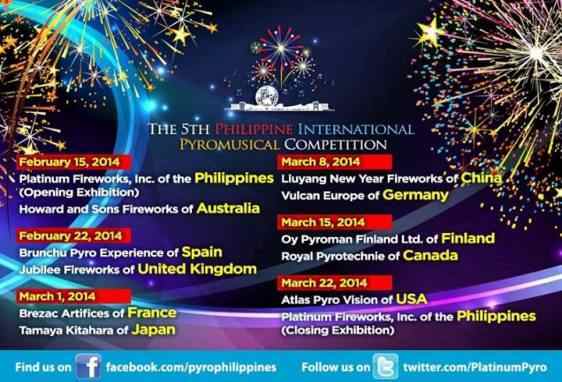 Here is the complete 5th Philippine International Pyromusical Competition Schedule. *The event will start at 7PM, I advise you to go around 4pm for you to be able to park on a better location where you can also see the fireworks clearer and nicer.